“When you are a full time employee at a place called hospital, occupational health hazard is an understatement, seriously!”, that was how a nurse described her job to me. Well no kidding. Having spent four months in a hospital as a Bio-medical intern, I second her thoughts. Terrifying it was. While unscrewing a malfunctioning bedside monitor, I used to pray that I find only technical faults inside and not a bunch of ICs dunked in a pool of puke. However, to leave when my shift ended was a piece of contentment. But for nurses, the job is tougher. Patients yell at them, punch them and some even throw up on them. 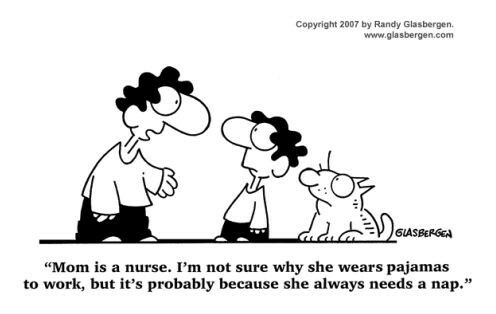 And unless a nurse can find a reliever, he/she can’t leave the patient’s side. Stories like these made me wonder, if nurses feel there was a bright side to it. “Oh! You can challenge anyone in a fastest-gulper competition, and develop a bladder that won’t complain for almost 8 hours!” chuckled a nurse. I guess, I’ll add sarcasm too, born out of the sleepless stressful nights and the need to keep cheer levels up. It was the mid-1950s, when stress was first identified as an occupational hazard. In fact, occupational stress is now cited as a significant health problem. In 1974, Freudenberger coined the term “burnout” to describe workers’ reactions to the chronic stress. Burnout is nothing but a syndrome marked by long term emotional exhaustion and loss of interest in work. While taking care of the patient THE basic job of being a nurse, it comes with colossal amounts of lifting, bending, twisting and running. This puts their bodies under a lot of physical stress predisposing them to postural problems and body aches. Top that with a consistent need of mental clarity, focus and ability to easily adjust in irregular shifts. Even during a Katrina or 9/11!! In a long form post, I discussed the various ill-effects of working in shifts and how shift work ultimately contributes to all kinds of illnesses. Additionally, the post lays out the possible solution for each problem and why I (and even science) feel yoga has a upper hand. Anyway as promised, today I’m sharing the winning side’s (yoga) mantra with all the nurses of the world on how they can ease their night/irregular shift work with a little Yogic intervention here and there. Without a stable and flexible back, can you call yourself alive? I feel like a zombie when I move around with droopy shoulders due to a back ache. Hence, core and back strengthening should be the centerpiece of any workout routine. And with the kind of heavy lifting and bending nurses do, this is mandatory. Does this need any explanation? Just as a tip I’d add, when you lift an object or a patient, keep your back straight and shoulders pushed back a little. This will help immensely in both reducing back pain and correcting your posture. These are to help you specifically strengthen and stretch your sides of the body and improve overall agility. Additionally, a regular practice of these poses will trim fat from both sides of the waist. To sustain long work hours with same mental clarity, make instant decisions, and still stay calm and present in the moment is not everyone’s cup of tea. What do you do when it’s the first demand of your job? You do Yoga! I mentioned them in the last for two reasons – first, I want you to do all the above poses (or as many you can) as and when you find time, and second, in case you don’t find time to do any of the above, you should do the below mentioned ones at least. Without fail. Needless to say, job of nurses is far more challenging than that of a doctor. While a doctor will spend 10-15 minutes with a patient, nurses take care of them all the time. However, it is equally rewarding too, because at the end of the day, they are the ones who connect with the patient and take home the peace of piecing someone’s life together. My request is just that in midst of all that, do not let your life fall apart. Along with your smile and self sacrificing attitude, keep yoga in your armory too! We have an amazing infographic for you too!